Benefiting from the epic success of the “Lord of the Rings” (“LOTR”) in terms of theme and source material, “Ring of Nibelungs” offers a dose of swords, kingdom, ice, magic, and dragon amidst the conflicts of love and greed. In “LOTR,” the plot revolves around a magic ring that grants the power to rule the world towards destruction. In “Ring of Nibelungs,” the plot revolves around the greed that blinds humans and leads them to their own destruction. Clearly capitalizing on the tested market of the former, this movie’s narrative still generally captures its intended audience. The story’s focus remains strong. Even with the huge scale and scope of its bulky material, it is able to turn the story into a generally entertaining mainstream fare. The tale begins with a brief background about the Norse gods including Odin, the god of wisdom and war and the chief of the gods. After which, the tale focuses more on the human characters from the legend. The plot features Siegfried (Benno Furmann), a conquered kingdom’s heir who grew up with the blacksmith Eyvind (Max von Sydow). When a meteor crashes into the Earth, he goes his way for it. 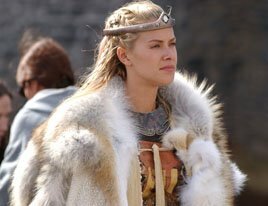 There, he falls in love with the Norse warrior queen Brunhild (Kristanna Loken). With the gods, they become destined to be reunited through their love. Siegfried uses the metal on the meteor site to forge his great sword. As he journeys his way towards Iceland to reunite with his Valkyrie love, he slays the dragon Fafnir for the Burgunds. Since then, he has been revered as the dragon slayer who is now invincible through the dragon’s blood (but similar to Achilles having a weak spot on his back). Siegfried ignores the curse that lies on the treasure and the Ring of Nibelungs, which was initially stolen from the Nibelungs by Fafnir. This later costs his life and his love for Brunhild. The treasure brought by Siegfried to Burgund leads to betrayal, deception, and greed. King Gunther (Samuel West) of Burgund envies the strength and heroic stance of Siegfried and he agrees to have him killed. Kriemhild (Alicia Witt), King Gunther’s sister, agrees to use magic to steal Siegfried’s heart for her own. Hagen (Julian Sands), King Gunther’s trusted advisor, kills Siegfried to get the treasure and its power for himself. The other people of Burgund blind themselves to their lust for gold when Hagen promises them part of the treasure if they would go by his side. Upon avenging the death of Siegfried by Odin’s estranged daughter Brunhild, she reunites with Siegfried by killing herself beside his cold body. This film doesn’t exactly offer the happy ending people usually prefer to see, but it is a rather good and faithful ending for such a tragedy-stricken material. Given the picture’s source material and marketing, this cinematic offering suggests that its story revolves around the character of Brunhild. However, Siegfried gets the most exposure in the movie. Looking into a broader perspective of how a woman in the character of Brunhild gets portrayed in this film, there is that irony on her great strength and warrior stance vis-a-vis her femininity, faith, intelligence, and love. The honeymoon scene of Brunhild and Gunther is such a comic scene, a rare type of honeymoon to enjoy on screen — the seemingly unbeatable wife pinning down the husband like a mortal enemy ready to be killed. Furmann is effective enough for the character of Siegfried. Only that, the young Siegfried child actor during the first few scenes leaves no much resemblance to the adult Siegfried. Loken looks great as the warrior queen. Brunhild’s crown, braids, fur coat, and cape seem inspired by Freya, the goddess of love and war and the wife of Odin in Norse mythology. West’s face looks too bulky at certain angles, but his acting for the King Gunther role generally works. Sands’ dark and gothic features offer a fine conviction for his dark and evil character. The production design, especially with the jewels and costumes, promotes a visual feast of Nordic grandeur. However, the dragon Fafnir’s design looks unimpressive. Although it becomes a bit of an issue that the epic musical score sounds very similar to that of “LOTR,” overall, the “Ring of Nibelungs” soundtrack turns out effectively haunting and compliments most parts of the story — except for the music at the end part that is not enthralling enough for the movie’s ending.